Watch the live stream for the reveal. 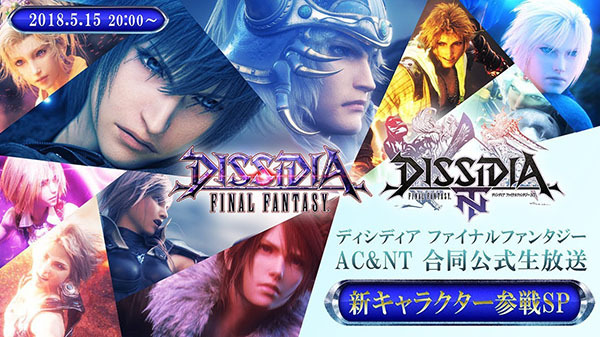 Square Enix will host a broadcast for Dissidia Final Fantasy NT for PlayStation 4 and Dissidia Final Fantasy for arcades on May 15 at 20:00 JST where it will reveal a new male character from the older half of numbered Final Fantasy titles that will appear in each game as a playable character for the first time in the Dissidia series, the company announced. You will be able to watch the broadcast live on YouTube and Niconico. The new fighter was previously teased as one of the six post-launch downloadable content characters. The first additional character, Vayne Carudas from Final Fantasy XII, launched last week. The 90-minute live stream, which will feature announcer and narrator Masao Koori, voice actress Marika Kouno, Famitsu writer Bunbun Maru, Dissidia Final Fantasy producer Ichiro Hazama, and director Takeo Kujiraoka, will also have other update-related information.